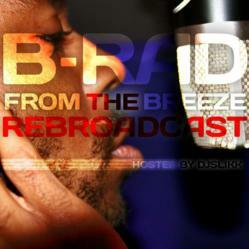 Coast 2 Coast Mixtape Promotions Presents B-Rad From The Breeze’s Latest Mixtape Project, Entitled “The Rebroadcast.” Hosted by DJ Slikk, it is Available for Free Download From Coast 2 Coast Mixtapes. Hip hop artist B-Rad From The Breeze recently released his mixtape “The Rebroadcast.” Coast 2 Coast Mixtapes presents the project, which is hosted by DJ Slikk and is now available for free download. “The Rebroadcast” features B-Rad on tracks like “In Case You Forgot,” “Chinese Finger Trap,” and “Words of Wisdom.” Production credits include Chris Smith of Sick Kid Productions and Beta Millz. B-Rad From The Breeze got started as an artist in 2006, under the name Delivery. In the span of four years, he released seven mixtapes, a full-length album, and a three-track EP. In 2010, he took a brief hiatus from music in order to find himself, having a spiritual awakening which caused him to change his outlook on life and his music. He returned to his craft in 2011 under the name B-Rad From The Breeze, releasing two mixtapes—one of which is “The Rebroadcast.” He’s not influenced by one particular musical genre, instead drawing from his diverse tastes to broaden his scope of artistry—so that when it comes time to make his own music, his palette has a lot more color to choose from. “The Rebroadcast” came about as B-Rad was looking through some beats, finding some that he had completely forgotten about. As he listened to them all, the mixtape’s concept started forming in his head. Over the course of the next six months, he was in the studio weekly recording tracks. Finally, he reached out to DJ Slikk to be involved in the project, and “The Rebroadcast” was born. B-Rad is currently working on a new mixtape, entitled “B-Rad Legacy,” due out sometime in 2012. He is working with several new producers on the project, trying to get a new sound. He is also working on creating his own label and getting it off the ground with t-shirts and other merchandise to follow, and YouTube reality show that will give viewers an inside look into his life as a musician and his personal life.